04 - Natural Selection 04-11 - Divergence of Character 100 The accompanying diagram will aid us in understanding this rather perplexing subject. 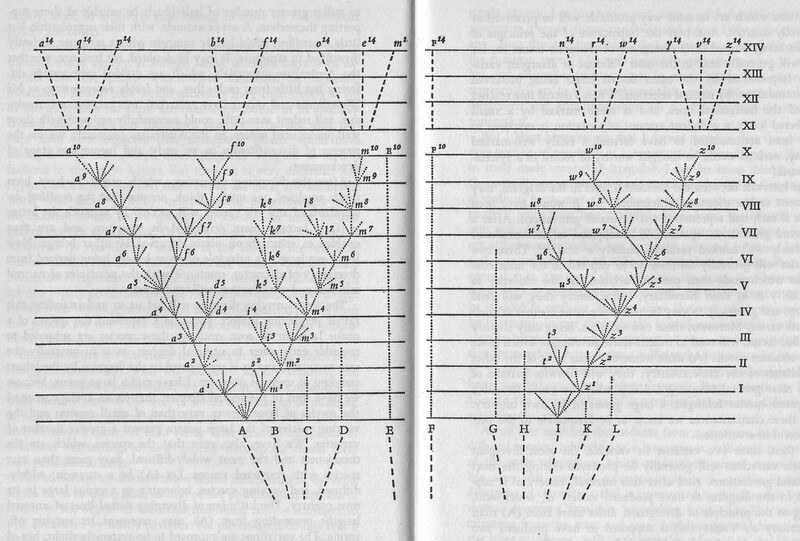 Let A to L represent the species of a genus large in its own country; these species are supposed to resemble each other in unequal degrees, as is so generally the case in nature, and as is represented in the diagram by the letters standing at unequal distances. I have said a large genus, because as we saw in the second chapter, on an average more species vary in large genera than in small genera; and the varying species of the large genera present a greater number of varieties. We have, also, seen that the species, which are the commonest and the most widely diffused, vary more than do the rare and restricted species. Let (A) be a common, widely-diffused, and varying species, belonging to a genus large in its own country. The branching and diverging lines of unequal lengths proceeding from (A), may represent its varying offspring. they an supposed to endure for equal periods. Only those variations which are in some way profitable will be preserved or naturally selected. And here the importance of the principle of benefit derived from divergence of character comes in; for this will generally lead to the most different or divergent variations (represented by the outer lines) being preserved and accumulated by natural selection. When a line reaches one of the horizontal lines, and is there marked by a small numbered letter, a sufficient amount of variation is supposed to have been accumulated to form it into a fairly well-marked variety, such as would be thought worthy of record in a systematic work.